When you think of prominent beer producing countries, Kenya isn't the first one that comes to mind. For many people I would be surprised if it's in the top 30! However they produce a lager which I rate highly enough that is has become a fridge regular at my house. The pour is a surprisingly light golden colour with significant bubbles rising to a large 3-4 finger white head. The head is magnificent, it appears to be quite dense and has excellent retention. It just looks fantastic, it's quite clear that the adjuncts are doing what they claim as the beer is one of the more pale lagers I've come across. However in my opinion this does not detract from what is a sensational looking lager. On the nose there does, at first, not appear to be alot of difference from your average adjunct lager (aussies think VB or Carlton Draught). Further down the line however there appears to be a bit more quality than first comes across. I can smell a slight sweetish grain aroma, that brings a bit of quality to this beers aroma. This quality definitely comes through in the tasting! 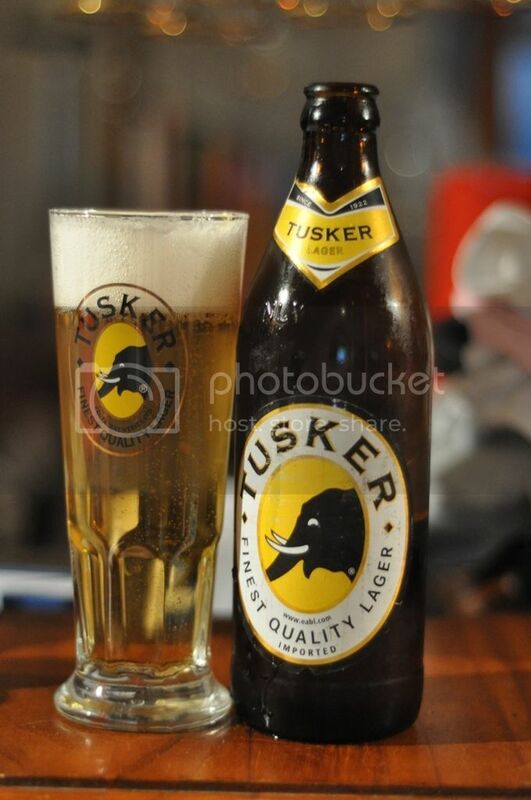 Tusker has a full bodied flavour while still keeping a light mouthfeel. The taste has the same slightly sweet grain flavour with elements of grassy (very mild) hops and a sweet citrussy malt. It is very crisp and easy drinking, the low ABV (4.2%) helps make this one of the easiest beers to drink that I have ever come across. It's a great session beer and you can just drink it all night. Legend has it that this beer was named for a stampeding bull elephant that killed one of the brewery's founding brothers in 1923. For the absolute purest it's not the most spectacular beer, but damn it's refreshing and easy to drink. I like it, all the people I've shared it with like it and it sells well whenever it's in stock at the beer store. It can be hard to find but it's definitely worth a try, there's something strange about this beer that makes you want to keep drinking it. If you find it grab some, you've got nothing to lose, it's good, cheap and you may just find a new regular beer for your fridge! This beer is excellent. It was introduced to me by an army mate who served with the UN in Rwanda. He came back with a Tusker T shirt after spending all of his leave in Kenya's capital, Nairobi. I now own one of the Tusker T shirts too. I've grabbed a number of cartons of this beer online and it is definitely easy to drink. The more you drink the more you want! Great beer for sure.